A pleasantly uneventful travel day brought us from Minneapolis to Amsterdam (on a practically empty plane) and then on to Barcelona. Aside from a small hiccup when the airport ATM ate my card and refused to return it, things were perfect. We made it to our AirBnB around 6pm, and met our host Andres. This apartment is the place he was born, though thoroughly updated. It’s in a newer part of town (close to the conference) and directly across from the soccer stadium. The first order of business was a trip to the grocery for snacks – Jamon iberico, cheese, the important things. After a nap, we set out for a little bit of exploring. 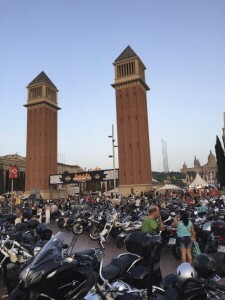 Andres clued us in to “Harley Days,” a massive gathering of Harley Davidson aficionados. It seemed like an apropos way to spend the fourth of July, so we set our course for the Plaza Espana. It was a loud, leather-clad, country music blasting kind of event. Which was a little funny. We got some food and listened to the band, did some people watching, then made our way home. Now it’s time for some serious sleep, so the fun can begin in ernest tomorrow.